Elaine Adair Pieces: Sometimes it takes WORK to find JOY! 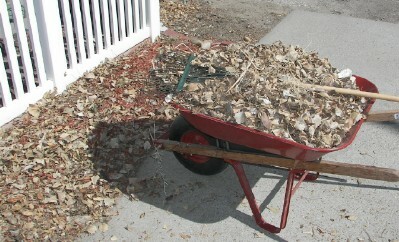 The sun has been shining, temps have been warm so I decided to move my winter body and rake debris off the garden and the yard. 19 trips to the "green" dumpster later and I found this tiny hope of spring - you have to look hard, there are tulips coming up in front of the wheelbarrow! Yeah spring!!! A week later (today) tulip tips are all over the entire bed. Just doing some WORK helps me to feel joyful, but seeing the new growth, is always an extra PLUS! And on the sewing/quilting front, here is my latest project, a version of Jamestown Landing from Quiltville.com, Bonnie Hunter. Instead of the string blocks, I used large HSTs. I counted the pieces, without border, and it's 2300. I'm still sewing the last parts, the last HSTs that replace the string units. NONE of the units are together yet, unfortunately. There are 30 stars in all. My Design Floor isn't large enough to have all of them laid out. Note that half the stars are "dark" (dark corners and centers) and half are "light" (light corners and centers). Sewing them is not a big deal - just have to pay attention. ALL the small HSTs units are the same. I purchased the dark blue fabric for the large HSTs. Other parts are all scrappy from stash. You'd think a person would run out eventually, wouldn't you? On a separate note, several weeks ago, a message popped up on Google indicating G would no longer support Bloggers, or was it Readers or ?? ?, as of a particular date. Has anyone else seen that message and/or knows what that meant? Yeah, I got that message too and have seen it mentioned on many of the blogs I follow. Google's taking down the "Google Reader" site in July. So if you read your blogs using that, you'll have to find another blog reader. Most of the blogs I follow have either moved to "Bloglovin" or "Feedly". Others have loaded their blog lists into both and are trying them out to determine which they want to use. All have said that it is pretty easy to transfer your Reader content to these other sites. There are also reviews on the web of both sites. I'm still waiting to read some of those to help make the decision so I don't have advice on either. Love your version of "Jamestown", Elaine. I avoid the string blocks at all costs. I think the buzz around blogland is that google will no longer offer "Reader". At least that's what I hear. Hints of spring all around, but still really cold here. Glad to see you're making progress with the JL varation. I have some daffodils blooming as of Easter morning (how appropriate) and tulips up as well but not blooming yet. Love this time of year. Now to get my asparagus bed cleaned of and start waiting for them to pop up...Yum! 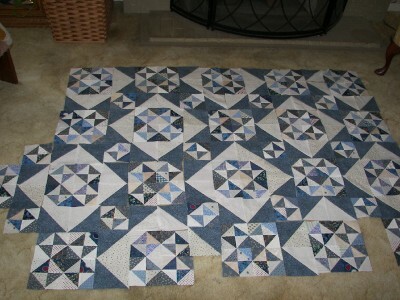 This is going to be a great quilt - love the light/dark stars. After such a frigid winter, isn't it nice to finally see some green! I moved over to feedly.com for my rss reader. Elaine, your Jamestown Landing quilt top looks like multi-faceted diamonds set in a bezel! Just beautiful. And congratulations on emptying out 4 boxes of stash that was used up in your pretty quilts. Atta girl!